is the ability to be persistence over time to attain difficult goals. Eventually every boat tips over, one must be resilient to right the boat. Resiliency (grit, tenacity and perseverance) is often defined by how a challenge or failure is overcome. This trait’s timeline is measured in years, though it can be practiced and understood in short practice sessions. Resilience is essential for a student’s ability to reach for and eventually succeed in longer-term, high order goals that are rife with challenges, obstacles and setbacks. Achievement often requires dependability coupled with the will to succeed. An OLP activities can be built to specifically challenge the resilience of the participants, so that each student explores their own ultimate long-term learning successes within and through failure. How can resilience be included in OLP lessons? Successful feeling students use techniques that will help them be persistant through challenges and failures. The idea of resiliency within an OLP program helps students place their struggles, failures and fears in a context of ‘experiences to learn from’ and not just a stable mind set of ‘can’t do it.’ The lesson structure helps students move from failure, to success, to challenge, to experience and from failure, to trying it again. Working off of the growth mindset trait, resiliency traits are presented within an OLP by reframing the group’s discussion of challenges, successes and failures. In order to place the experience within a learning context, OLP resilience activities should contextually influenced by the learning environment that use positive psychological resources and framing. Each OLP activity is transparently presented as challenging to the group and individual. The instructor should be clear each participant will experience failure and success. 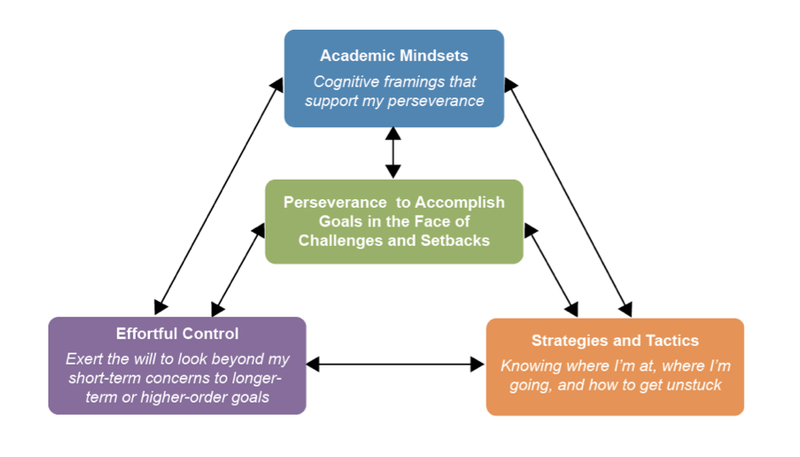 These psychological framing structures: (a) academic mindset, (b) Perseverance to accomplish goals, (c) strategies and tactics and (d) effortful control guide the student through the challenges with the idea that these activities bring about wisdom. Practiced within an OLP setting that is supportive yet rigorous, students will experience a fair, caring and respectful learning climate that expresses high expectations, while celebrates effort over ability. The non-cognitive trait of resilience will grow as the student experiences structured feedback and the minimal emphasis on extrinsic rewards. Students have the opportunity to engage in long-term or high order goals. An OLP activity has the chance to grasp some personal or objective goal of the participant so that they can then be willing to spend time, effort and risk on the task. The worthiness of the goal needs to be intrinsically held and pursued. Place the activity within context of the student’s lives, interests and future goals. Even if the activity is uninteresting the experience can be transported over to an actual life skill. The activities have a supportive and rigorous environment to help accomplish goals. Trust, fairness, mutual respect and empathy are the building blocks for every OLP class, activity and discussion. A hundred percent participation and subjective success expectations set within the first moments of class. Offer legitimate praise to boost self-esteem. Praise the effort not the ability of the student. Treat people fairly not equally. Stop a negative chain of events. If student’s aren’t finding subjective success hit the restart button. Be aware of negative failure. Provide alternate routes to success. Adjust the ‘finish line’ of success so that students can understand their own personal goals, not just a measure against others. Remove stressors (when appropriate). For example, if students are worried about performance in front of classmates, remove the group for a bit to give the student space to fail personally not in public. Help students set realistic and manageable goals. Have students chunk their expectations and measure of success so that they can experience incremental failure or accomplish, not just struggles that can’t be overcome. Help students problem-solve difficult situations. Balance this within the idea of a student’s autonomy, read the situation so that impossible obstacles are overcome. Recognize and understand cultural differences among the students. Not every student or group will have the same interest, dynamic or cultural objectivity of success. Click on the link below to view the resilience activities and lesson plan link.